The parish of Taverham is situated in the Broadland District of Norfolk. It lies east of Ringland, north of Costessey, west of Drayton and south of Felthorpe. The name Taverham may derive from the Old English meaning ‘enclosure with red soil’. The parish has a long history and was well established by the time of the Norman Conquest. Its population, land ownership and productive resources were detailed in the Domesday Book of 1086. This document revealed that the parish possessed a share in several mills and a church, as well as possessing woodland and numerous sheep and pigs. The earliest monument recorded in the parish is a possible Neolithic long barrow (NHER 21117) that was identified from cropmarks. Several potential Bronze Age ring ditches (NHER 7830 and 36740) have also been discovered through a study of aerial photographs of Taverham. The only other prehistoric site on record is a scatter of prehistoric pot boilers (NHER 32782), which relate to the heating of water for cooking and washing. A large number of prehistoric objects have been recovered from the parish. A couple of Mesolithic artefacts have been reported, and these comprise a flint flake (NHER 18059) and core (NHER 14870). However, the Neolithic period seems to have been the busiest one, as evidenced by the collection of flint tools, which include axeheads (NHER 7784, 7828 and 7829), a knife (NHER 7835), a scraper (NHER 14870), a borer/awl (NHER 40418) and an arrowhead (NHER 7831). The production of flint tools continued into the Bronze Age (see NHER 12195), but the first metal object in the parish also dates to this period. This takes the form of a copper alloy axehead found on a field surface by a metal detectorist in 1999 (NHER 35028). Sadly, very little archaeological material of Iron Age date has been reported in the parish. The sole find comprises a few sherds of Iron Age pottery from an area once known as Drake’s Green (NHER 32781). No Roman sites have been recorded for Taverham, but a number of artefacts have been recovered through metal detecting and fieldwalking. Many of these comprise pottery sherds (NHER 7806) and coins (NHER 7838 and 7839) but a number of more interesting items have retrieved, such as a decorative mount (NHER 31101), bracelet fragment (NHER 31101), a plate brooch with signs of colourful enamelling (NHER 32286) and an unusual ‘bridge’ brooch (NHER 35252). 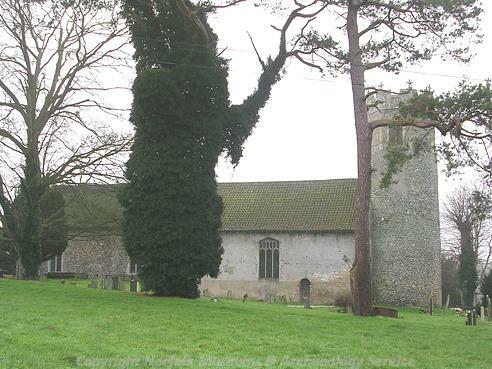 St Edmund’s Church in Taverham (NHER 7908) has Saxo-Norman origins and features an impressive round tower with an octagonal top and flushwork battlements. The church was extended in the 13th and 14th centuries, and altered after a fire in 1495. Inside there is the head of a Late Saxon cross and various pieces of exceptional medieval woodwork, including a beautiful carved communion rail with flamboyant tracery. The church is the only Saxon site or monument in Taverham, but several Saxon artefacts have been recovered. The early part of the period is represented by a brooch (NHER 24328) and part of a girdle hanger (NHER 24896). Middle Saxon finds consist of a strap union (NHER 28167), and the finds from the latter part of the period include strap ends (NHER 23867 and 23987) and disc brooches (NHER 23866 and 23988). However, the most exciting find from this period is a 10th century Viking trefoil brooch known locally as the ‘Taverham Piece’ (NHER 24649). No medieval manor house survives in Taverham although two possible manorial sites have been identified. The first is in Taverham Park and takes the form of several rectangular ditched enclosures (NHER 25715), while documents show that the second existed to the rear of St Edmund’s Middle School in an area covered by modern housing (NHER 13249). During the medieval period it is also possible that Taverham had a Holy Well, a watermill and a Guildhall. St Walstan’s Well was the supposed resting place of the saint’s hearse, but its exact location in Taverham is uncertain (NHER 12254). Records also show that Taverham had a medieval guildhall (NHER 13257). No trace of the guildhall has been found but there is a Taverham Guildhall in Norwich. According to an informant the Guildhall belonged to Costessey, then to Taverham then the court was transferred to Norwich, which may explain why the name was carried over into the Norwich building. The watermill is marked on maps in the area of Tunstall’s yard (NHER 29022), and this could well have been one of the mills mentioned in the Domesday Book entry for Taverham. A selection of everyday medieval artefacts has been recovered from various locations across the parish. Finds of note included a circular copper alloy brooch (NHER 7840), a 12th century corbel in the form of a melancholy man’s face (NHER 24192) and a jetton (NHER 35029). By the post medieval period Taverham had a number of flourishing industries. First and foremost of these was paper production at the paper mill (NHER 7902), which was in existence by 1700. This mill was one of the most important in Britain at the time and during the period 1846-90 the mill was powered by eleven steam engines and three water waterwheels and had one hundred workers. It also produced The Times newspaper and Oxford English Dictionary before its closure in 1900. Additionally, in 1967 a post medieval brick kiln was found at Spring Farm in Felthorpe (NHER 7785). The post medieval era also saw the construction of Taverham Hall (NHER 7903). This grand abode dates to 1858-9 and is built from red brick in a Neo-Tudor style. It has a kitchen garden supposedly designed by Soane. The remains of an earlier Hall are supposed to exist on site, but work to locate any traces of this former building has been unsuccessful. The present Hall stands within Taverham Park (NHER 30525), which predates it as it was created in 1784. Some exotic species were planted here in 1840 before formal gardens were laid out in 1860. Most of the park is now under the plough or used as playing fields. Other structures from this period include two barns: Spring Farm Barn (NHER 7786) and Church Farm Barn (NHER 41916). Both are substantial buildings of 18th/19th century date. Spring Barn Farm is notable because it seems to incorporate part of a nearby brick kiln (NHER 7785). Few post medieval finds merit a mention although it is worth stating that a nice clay tobacco pipe (NHER 32781) and part of a iron knife (NHER 7841) have been found. During World War One Taverham was host to a military airfield (NHER 13627). The exact location is uncertain but it may have stood to the south of Taverham Forge on Fir Covert Road. A number of World War Two anti-tank cubes and possible machine gun emplacement (NHER 32488) have also been identified to the south of the Ringland Bridge and to the east of the road. A rather more dangerous World War Two find was an unexploded hand grenade unearthed in the garden of number 16 Beechlands (NHER 28167). More recent records relate to a lime kiln (NHER 16689) built in the 1930s and a nuclear underground bunker built in the 1980s. The kiln stood near the Scout Hall on Nightingale Drive but is probably now buried as no trace is visible. The nuclear bunker (NHER 36959) was built in the Orchard Bank area by a private individual. It was constructed following guidelines issued by the government and has concrete walls and a steel, concrete, polythene and bitumen roof. The bunker retains its original internal features and fittings, including a spa bath. Thomas Sunley (NLA) 16 July 2007.